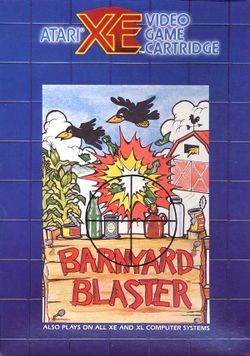 Barnyard Blaster is a shooter game that requires a light gun to play. It was developed by K-Byte (James V. Zalewski) and published by Atari in 1988 (some sites report this as December 31, 1987). The game was released for the XE models of the Atari 8-bit family, as well as the Atari 7800. The game features four stages with increasing difficulty that repeat indefinitely after completing the sequence. Players can choose to play by themselves or at the same time with a second player. This page was last edited on 25 September 2009, at 02:44.